The Carpenters installed all of the interior doors in the house, including this 1 and a 1/2 double door for the master suite. The doors are hung quickly by simply shimming each pre-hung door in to the opening and nailing them in place. 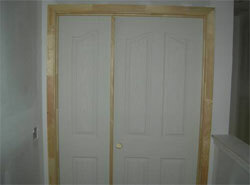 Trim molding is added to cover the gaps and provide a finished look. This molding will be painted to match the rest of the trim in the house. When it comes down to adding the necessary partition to a house, no home will be complete without the installation of interior doors that will not only divide the areas, but also afford the people using the different rooms a good amount of privacy. Choosing the interior doors that will fit best with the theme of your house can be quite problematic. The good news is that there are certain things that you may do to make sure that you will be picking out the options that will work best for your families use. Make sure that you keep the following considerations in mind as you go about choosing among the options that are available to you. First and foremost, you need to hatch a plan not only about where you are going to place the doors, but one that will allow you to plot out the amount of space that you will use for them. People often make the mistake of failing to consider the space that the doors will need to be able to swing in and out. If you do not have enough space for a swing out door, for example, then you can choose to use a sliding model. Make sure that you get a clear idea of how much space you need for your installations, and whether you can spare it. While it will be you and your family who will be using the doors once they are installed, it will do you well to get the help of a trained eye when it comes to sifting through all the options that are available to you. After all, a professional is one who has already gathered a certain amount of experience in the field. Not only will an architect be able to help you choose the model that will work best for your needs, but he or she will also be able to help you choose the interior doors that are made out of the best possible materials. This does not mean that you should leave the decision to your architect, however. It is your home, after all, and you are the one who will be using the doors regularly. With this said, make sure that you limit your options among styles and designs that will fit your personal taste and preferences. Make sure that you only choose among doors that will fit your family's lifestyle and your personality as well. Avoid buying glass doors, for example, if you or any member of your family has the tendency to be clumsy. Try to avoid rushing into any type of decision, especially since the good door options that are available in the market rarely comes in low prices. Since you would be shelling out a substantial amount of your home budget for this type of purchase, then you should at least ensure that you will take the time in considering all the options that you have. Go through all the home improvement resources that you can find, you will certainly get a couple of tips from them. Finally, never sacrifice your creativity for cost effectiveness. While most people simply go about choosing the cheapest doors that they can find, there is a big possibility that choosing the simplest option will not do anything in boosting your home's aesthetic quality. There are a lot of affordable options that you may choose to customize yourself. Consider buying your doors under this criteria and simply adding customizations as you see fit. Think about using unconventional materials for your doors as well, especially if you are trying to maintain a more modern look and feel in your home.